Dr. Terrence Yu has been practicing dentistry in Phoenix, Arizona since receiving his DDS degree from Meharry Medical College (Tennessee). Dr. Yu received a B.S. in Biochemistry from UC Riverside and a B.S. in Engineering from CSU Long Beach. He worked as an engineer for Fortune 500 companies such as Xerox Corp and Motorola, Inc. After 11 years as an engineer, Dr. Yu found his calling as a dentist. After graduating from dental school, he settled in Chandler, Arizona with his wife and three children because of the people, their church, and the city. 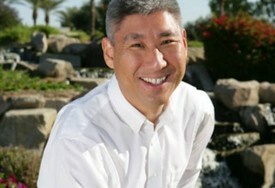 Dr. Yu is active in the Arizona Academy of General Dentistry, serving as a board member and in other capacities. He is also active in the Arizona Dental Association and Central Arizona Dental Society, serving in various committees at the state and local level. Dr. Yu is a member of the Academy of General Dentistry, American Dental Association and the select Student Clinicians of the American Dental Association. Dr. Yu has a passion to educate his patients on how to achieve optimal and aesthetic dental health. He has given Dental Health presentations to schools and churches every year in honor of Children’s Dental Health month. If you would like Dr. Yu to give your child’s class a Dental Health presentation, please contact our office at (480)726-2011. Dr. Yu and Maricopa Integrated Health System collaborated, with the sponsorship of the American Dental Association Foundation, to create a web-based dental education module for 1st-3rd graders. This module, called “Dental Fun“, is located at www.mihs.org. Dr. Yu is an alumnus of the Pankey Institute, a leading dental continuing education provider.